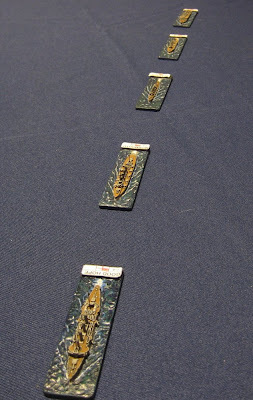 Originally I used these for WRGs WW2 rules… Then Crossfire… They’ve probably seen the most action fielded as a company in Flames of War, but I’ve pretty much all but abandoned that. I think we used them for I Ain’t Been Shot, Mum, once or twice. Currently I’m using them for much larger scale actions with Blitzkreig Commander. Seven command Stands. These were Platoon Commanders or observer teams in FoW. I did have a larger CHQ and 2IC but they seem to have disappeared… They will be HQs and FAO/FACs for BKC. The one in the back with the officer dressed in battledress and an SD Cap acts as CO for the time being until I can make a new one… That may be a while. A mix of Old Glory, Battle Honors, and Battlefront. 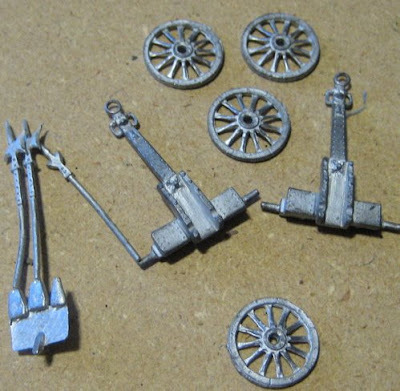 Four Boyes ATR teams and three (unpainted) 2” mortar teams (platoon support weapons for FoW). If those 2” mortars ever get painted it will truly be a wonder. Don’t get me started on how hard it was to get some bloody 2” mortars…. 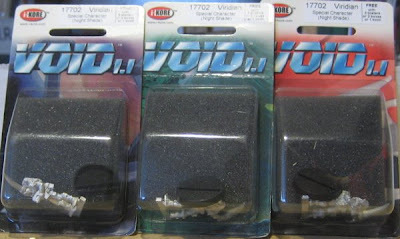 I have them now though, should I ever decide to play at a scale that I need them…. The Boyes teams are from Peter Pig, the 2” mortars from Battlefront. Vickers Machine-guns. One still hasn’t been re-based. A Platoon in FoW, a Company in Bkc, both from the Divisional MG/Support Battalion. All from Battle Honors. 3” Mortars. 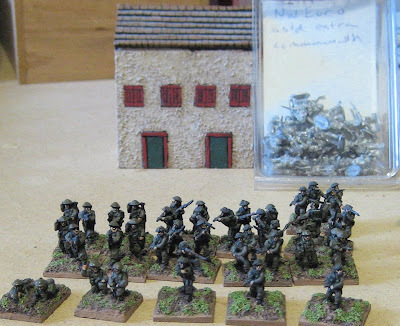 A full battalion’s Mortar Platoon for FOW, or enough Mortar Platoons for six battalions in BKC…. Think that last one will ever get re-based…? These are a mix of Battle Honors and Battlefront. AT support; four six-pounders (and jeeps to tow them), two two-pounders. Again, a battalion’s AT Platoon for FOW, or enough AT Platoons for four battalions in BKC…. Or perhaps the 2-pdrs could be issued to the infantry battalions and the 6 pdrs could be from the Royal Artillery….? Guns and crew are Battlefront, jeeps and drivers are Old Glory. Pioneers – for an FOW pioneer platoon or enough pioneers platoons for a brigades worth of battalions – which is all I ever imagine I would ever field. Battlefront. Three 5 CWT CMP trucks. 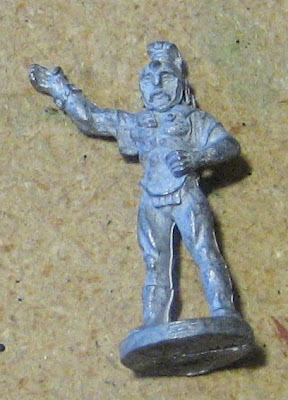 I’m sure I have a few more of these elsewhere… needing to be painted… Battlefront. A Dingo (I think) and a Rolls-Royce Armoured Car – Recce platoons for BKC. The Dingo is from Battlefront the Rolls is from Minifigs. Matilda IIs. Two platoons or two squadrons, depending on the rules, from a supporting Army Tank Brigade. The tanks are Old Glory – I think the crews were from Peter Pig…? A battlefront unpainted busted tank objective marker that was given to me recently and the beginnings of an HQ for the above Armoured Squadrons. These are all Battlefront. As the Battlefront Matilda is slightly bulkier than the Old Glory ones, and tends to stand out a bit, I thought I’d make it an HQ. For the HQ stand I will (someday, maybe) paint up the Dingo and add it to the stand, and perhaps add a few more figures, to make a bit of a mini diorama. To add some versatility to the force I thought I’d pick up a couple of Shermans and paint them with Canadian markings for the 1st Canadian Army Tank Brigade so the force could also be fielded as Canadians in Sicily or Italy (in the summer at least!). The bases aren’t finished yet – at some point they will look like the Matildas above. These are mostly Battlefront. The un-based one off to the right of the picture is from Battle Honors. Objective markers. 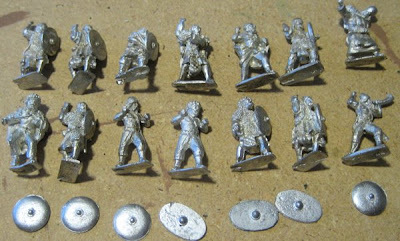 I think these came from JR Miniatures…? A Commando Troop for FoW, or nearly a whole commando for BKC. I’d need two more stands (assuming each stand represented a Section and two stands made a troop….) 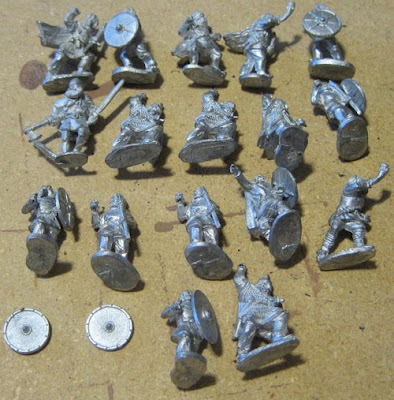 for a fifth troop plus a Heavy Weapons Troop – of course for BKC I HAVE extra Vickers and Mortar stands… These are mostly Battlefront, but there is a few Peter Pig commandos thrown in there for fun. “Bailed out” markers for FoW (Battlefront). The rest of the patrol…. Not for the desert, but I wasn’t about to do a separate post just for these. These are Canucks for Northwest Europe ’44-’45. They’re still based for The WRG rules we started with. The rifle men are all Old Glory and the platoon command, support and bren-gunners are from QRF. The rest of the “To Paint” pile. Not a lot there – so close, yet so far…. 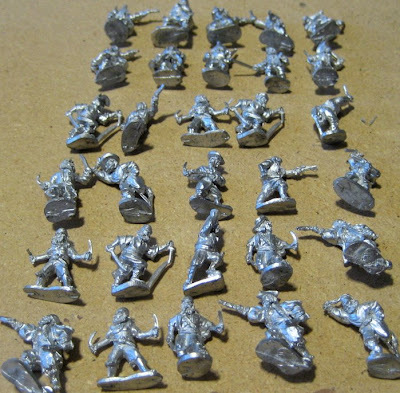 Though I have enough for another 27 stands of Rifles I could only imagine ever painting up another 14 stands worth – for a total of 36 stands. That would make for 6 full-strength platoons (2 companies) in Flames of War (or any other 1:1 figure scale game where stands are half-sections), or three full-strength battalions (a brigade) in Blitzkrieg Commander (or any other game where stands are platoons). -1x HQ (3 total) – DONE! -1x Pioneer Platoon/Stand (3 total) – DONE! -1x AT Platoon/Stand (2 Pdr or 6 Pdr - 3 total) – DONE! -1x Platoon/Mortar Stand (3” - 3 total) – DONE! -1x Platoon/Carrier Stand (3 total) – DONE! MG Company (3x Vickers Stands) – DONE! Actually for both the above batteries I could just field FAOs, which I already have DONE! Reconnaissance – Dingo, Universal Carrier, or Rolls Royce stands… DONE! 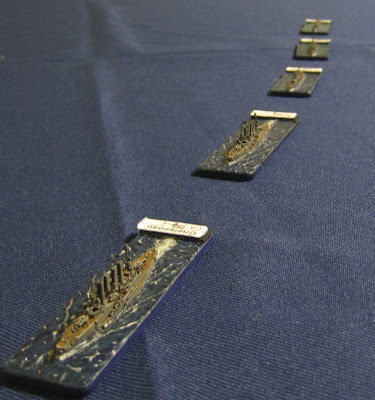 -2 Squadrons of Matilda II – DONE! 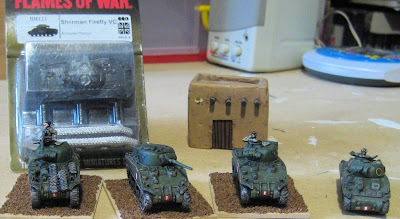 -1 Squadron of Shermans – Have: 3x Sherman V Painted, 1x Sherman VC To Paint! 1x FAC (I could use the Dingo or one of the other Observer Stands) – DONE! Then there’s the LRDG Patrol…. Ugh... What to do about them…!? I think Someday I will paint them up and hang on to them for the fun of it…. More Taking Stock - 15mm WW2 Germans; Early War and DAK. I started this guy ages ago. I noticed him in the “on deck” box and he really only needed the base finished up so I finished it… I have no idea who made this. I’m sure I’ve had it sitting in a box unpainted for a dozen years at least. I took it out, based and primed it last fall, then painted it at some point over the winter. 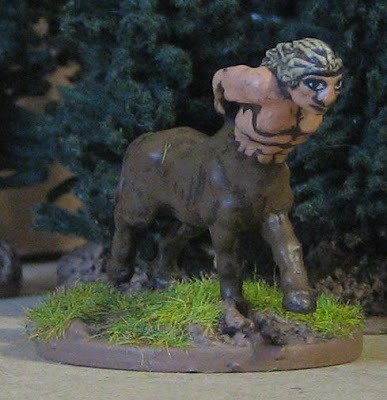 Do I count this guy as "foot" or "mounted" for the painting totals....? Who says that lead that sits in the closet for years will never get painted!? Stock taking (15mm WW2 to start) and terrain. Really. We played a game on Friday night this week instead of the regular Thursday as my friend Curt from Regina was in town. 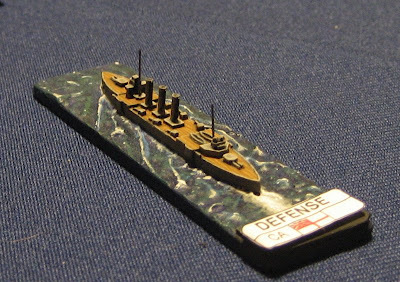 He ran a lovely little Great War naval action using the new General Quarters III "Fleet Action Imminent" rules (and his BEAUTIFUL 1:2400 scale GHQ ships). It was quite good fun and quick to pick up. At the outbreak of the Great War in August 1914 Admiral von Spee, commander of German naval squadron in the Far East, found his command in a very tenuous position. Germany, while having significant influence in the European theatre of operations exerted very little power in Asia and the Pacific. Germany had only the pretense of an Asian 'empire', only holding a naval station at Tsingtao China and this provided no guarantee of supply from the Fatherland. Spee's ships required large quantities of coal in which to operate and this could not be relied on by the German possessions or allies in the region. Due to the demands of re-coaling Spee felt compelled to either order his ships to operate individually as privateers in order to take supplies by force, which would break-up his command, or to stay together and attempt to break out of the Pacific and make their way back to the security of the High Seas Fleet in Germany. Being a naval officer from the 'old school', Spee decided to keep his forces together and attempt a passage back to home waters. Conversely, the British, while commanding a huge fleet, possessed a far-flung empire, which divided both its resources and attention. The vast majority of England's most modern warships where husbanded in home waters to face the German High Seas Fleet and to secure the critical Atlantic convoy traffic supplying Great Britain. It therefore fell to a polyglot force of mismatched assets under Admiral Sir Christopher Craddock to face the challenge of tracking down and confronting Spee's squadron. Craddock held no illusions to the chances of his success but hoped that with a little luck he could maul Spee's force and give a good account from his command. On the afternoon of November 1, around 100 miles offshore of Coronel, Chile, the two squadrons sighted each other, closed and engaged. John and I played the Germans. 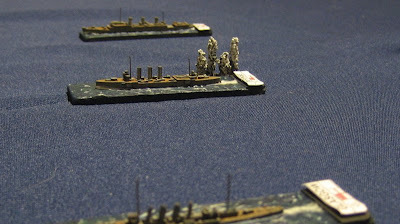 I took the two armoured Cruisers, and John took the three light cruisers. Gary and Curt played the British. Gary had the Good Hope and Monmouth, while Curt took the Defence, Glasgow and Otranto. 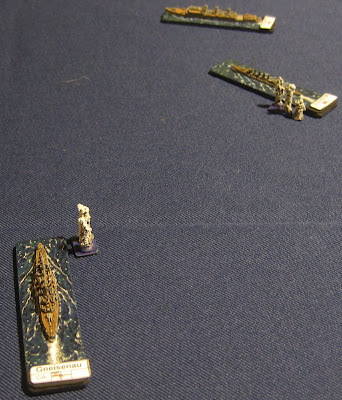 The starting position of the German Far East Squadron lead by my two armoured cruisers; the Gneisnau and Scharnhorst. 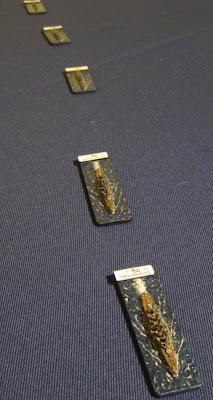 Close up of the Defense – aren’t they just lovely little ships?! Bravo, Curt! The Monmouth and Good Hope. The first couple turns we spent turning our line around and trying to close the distance between the squadrons to give ourselves a bit better chance of hitting. The Light cruisers with only 4.2” guns would have to get quite close. Looking back we (John and I) probably could have each taken one of the Armoured Cruisers and a couple of the Light Cruisers and just stood off and pummeled the British Squadron from a distance. I was surprised how quickly they actually closed…. 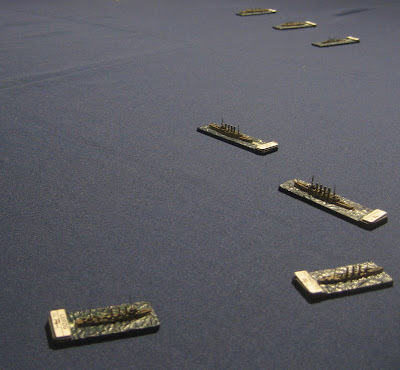 The British broke their line-ahead formation and came at us as a gaggle. 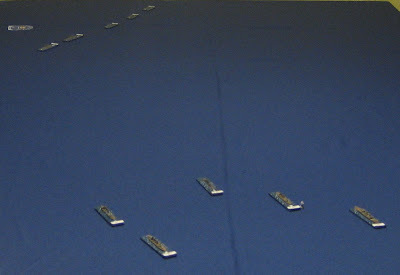 For the first half dozen turns or so – which were closing and maneuvering we had a line down the center of the table that represented 10000 yards – this is taken shortly after we had closed enough distance that it could be removed. 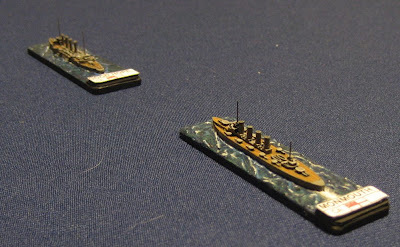 In the foreground is the British Squadron. In the distance are the Germans. Around this time we stared exchanging long range shots. Now the germans have finished turning and are in a full line-ahead formation and the Gneisnau and Scharnhorst are starting to pound the British. The Gneisnau and Scharnhorst have turned to give the British broadsides and the lighter cruisers are carrying on ahead to close the distance some more. 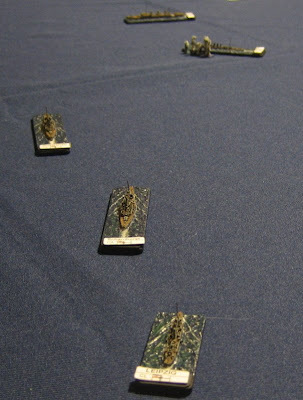 The British are taking a pounding – that’s four penetrating hits on the Defence from the Gneisnau on Turn 11– resulting in Main Turret damage, Bulkhead damage, and an Engineering Critical…. OI!!! I think this is the Good Hope taking hits from the Scharnhorst. Their first volley caused ammunition and BRIDGE criticals – Killing Craddock!!! Luckily they flooded the magazine and the whole ship didn’t go up on the first volley… but they were essentially done at this point. The next turn one of John’s ships, the Nurnberg, got a shot in on the Good Hope causing a Fire Control critical – not sure what the effect was… but it sounded drastic! 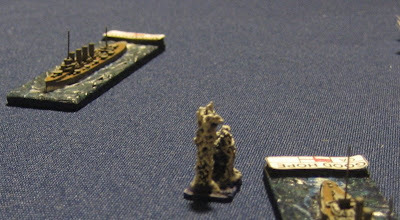 The Gneisnau and Scharnhorst, in the middle of the picture are actually firing broadsides at the Good Hope and the Monmouth which are off to the right. The Good Hope taking some more hits. This is Turn 15 – the last turn we played. Having sunk the Monmouth the previous turn the Gneisnau started firing back at the Glasgow (which had been firing at it for a couple turns). 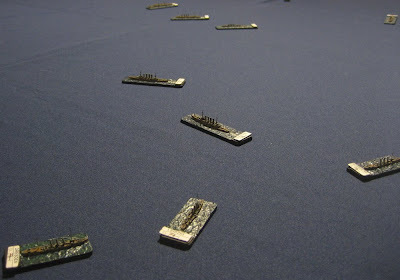 On this last turn the Scharnhorst sank the Good Hope and we called it a game…. This was a totally fun game (THANKS CURT!) …and I’m not just saying that because we utterly destroyed the British Squadron – we all pretty much knew it was going to work out that way from the get-go. I would have had just as much fun playing the British – seeing how much damage I could do before heading to Davey Jones Locker. I have to say when Curt busted out the play sheets the tables and charts all looked rather intimidating! Once we actually figured out what they all meant (which wasn't so difficult as I initially imagined) it was really rather simple and played very quickly. 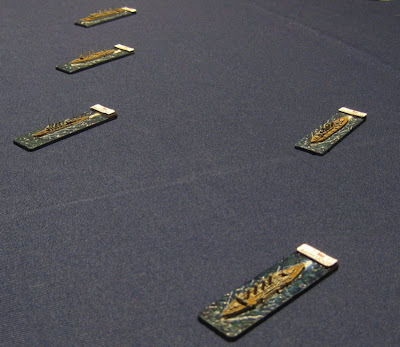 Four of us (three who had never played the system and were completely ignorant of Great War naval combat), playing with about 5-6 ships, all picked it up rather quickly and played out the engagement in 3-4 hours (and there was a lot of side discussion taking place). The scale of the action seemed about right. I'm not sure how really large actions would play out; I could see it bogging down a bit. Swashbukling Elfie Pirate - YA-HARRRRR! 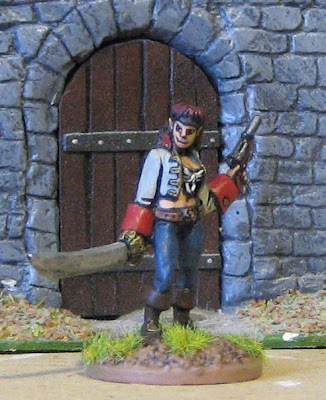 This is a Reaper Miniatures "Half-elf Pirate". Amanda will be using it in our Savage Worlds game. 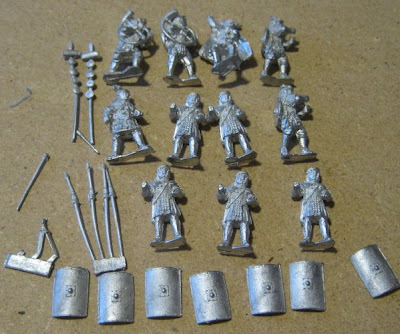 In addition to the toys pictured below there was a copy of Rules of Battle from Minden Games. The stupid part of me wants to hold on to this. 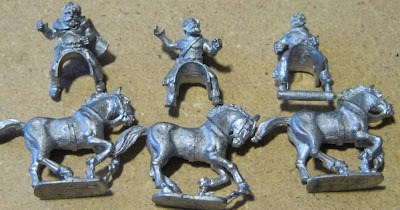 The stupid part of me has amassed a ridiculous number of miniature war games rules that I will just NEVER read – let along play – just because I got them for a “good deal” (just LOOK at them all). I think I will pass these on to John (Bertolini) – it’s totally his period. Some Old Glory Seven Years War figures. Not entirely sure what they’re supposed to be… Looks like French. 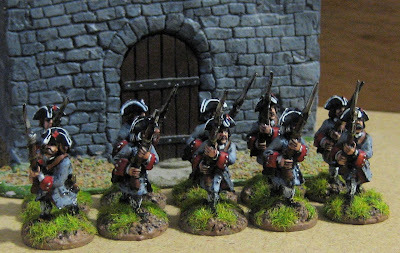 Anyway, they’ll do fine as some Frenchmen for skirmishing. More Old Glory PIRATES! It looks like the Pirate Captain and Pirates with Cutlasses packs. 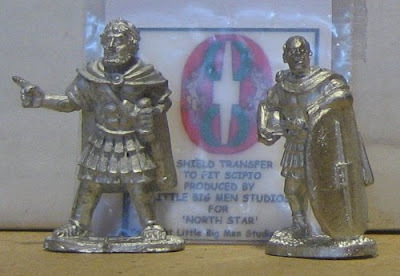 Some sot of Roman commanders. I’m not sure of the make. I know enough to recognize them as Roman – but I have no idea WHICH era of Romans…!? Anybody? 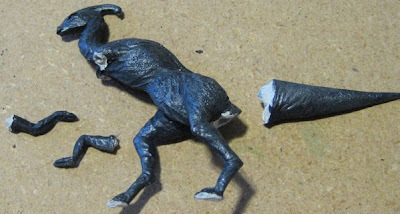 A Parasaurolophus. I know this because I have a 4 year old son. 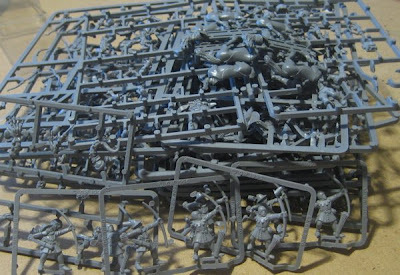 A big PILE of GW plastic stuff… Unfortunately not enough of any to make unit for Warmaster (yes, I’m planning on playing Warmaster with 28mm…), but I should be able to use some for Savage Worlds Fantasy skirmishing… Included in this lot are 8 Human Archer types (Brettonians? 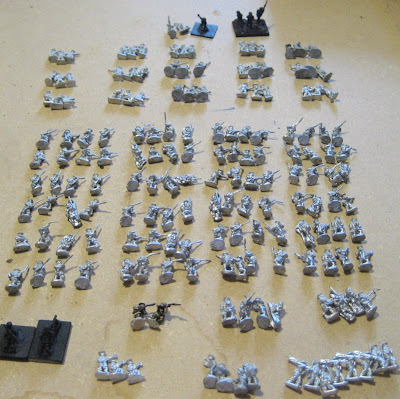 ), 3 40K Humans (Imperial Guards of some sort I assume), 4 mounted and t dismounted Wood Elf Horse Archer types, 4 Dwarves, 2 Ogres (these may go to John Burt – if I ever get around to painting the Chaos Ogre Command he gave me to paint…), 4 Zombies, and 4 frightful looking creatures that I am guessing are Dryads (I thought dryads were supposed to be hot looking chicks!? 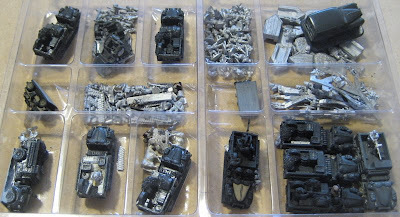 ), and a sprue of chaos bits. Some of it is pretty neat looking stuff. Too bad it’s all so darn expensive! 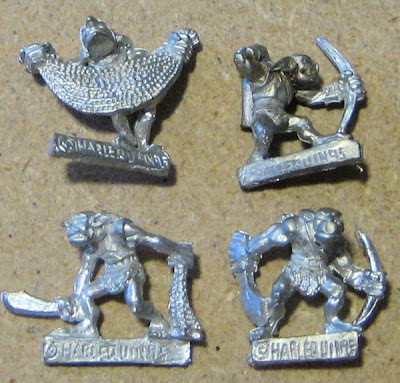 These are wee goblinish things – almost like snotlings… but made by Harlequin. 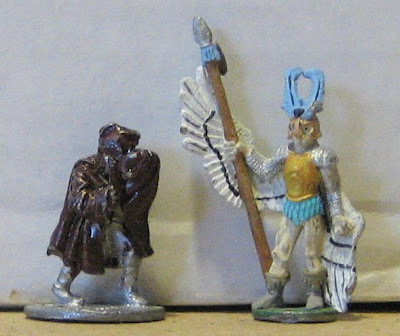 Some mounted Dark Ages types… I have no idea what…? Scotts? Picts? Irish? Welsh? What’s the difference, really? Anyone know that they’re SUPPOSED to be? 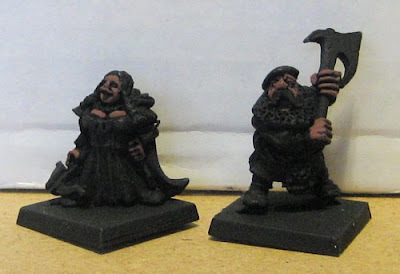 More Dark Ages types – these are Gripping Beast. But again, I have no idea what they’re supposed to be. I think some might be Irish? Still more Dark Ages types. 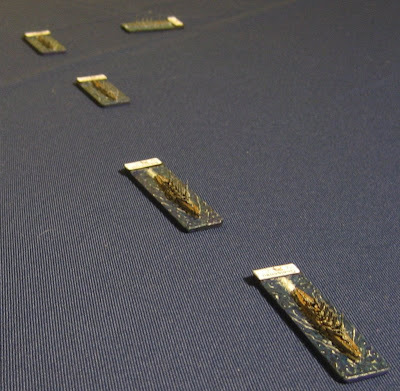 Same goes for these – what are they? Does it matter? They’re made by Old Glory, I know that much. All in all a pretty good trade – got rid of stuff I will never use, got some stuff that I will… I really need to finish cataloguing all my stuff – and post some more stuff for trade (15mm Falshirmjagers will be next…).